An index of my vegan recipes. See? Not deprived. A list of my travel articles. I'm a published author. No, really. Read all about it at my other website. Oliver St John Gogarty's Pub in Temple Bar, hang-out of writers and revolutionaries. This may come as a surprise, but there is more to do in Dublin than sit in a bar and drink Guinness. This activity, of course, consumes most visitors to Dublin, and locals as well, if the flatbed lorry loaded with kegs we saw in Temple Bar is any indication. Dubliners take their drinking very, very seriously. In fact, according to the Rough Guide, Dubliners "party with a panache verging on the reckless." But don't be fooled: the culture of Dublin extends far beyond the end of a Guinness spout. Dublin is also a cosmopolitan European capital, first settled by the Vikings, who called the place Dubh Linn ("dark pool"). It was during the Georgian period, though, that the modern Dublin began to emerge, and is still visible today. One of the oldest preserved illustrated manuscripts, the Book of Kells—the four gospels, resides in Dublin at the Trinity College Library. No photos were allowed, nor were they allowed of the Long Room upstairs, one of the most beautiful rooms I've ever been in. The dark wood barrel-vaulted ceiling is magnificent, but don't fret if you can't get to Dublin to see it. If you've seen the Star Wars flick "Attack of the Clones" you've seen a replica, albeit an unauthorized replica. Inspired by the old manuscripts it housed, I decided my personal quest while in Dublin would be to find an old book to add to my collection. (It's a small collection, of musty tomes that mean more to me than to any serious collectors, so if you've any plans to break in, mind you you're better off just nicking my iPod. Desk drawer, top right.) I consulted the Rough Guide and found The Winding Stair just across the river from our hotel. Here I scored the second volume of History of the Norman Conquest by Augustin Thierry, printed in 1847, for €10. Another good haunt for (mostly cheap) used books is Green's bookstore, at the northwest corner of Merrion Square. If, on the other hand, you're actually serious about collecting books and want a first edition James Joyce, signed by The Incomprehensible One, try Cathach Books on Duke Street. I've never been very familiar with Irish literature; outside of Roddy Doyle I'd only read a few chapters of The Dubliners. But that didn't stop me from taking the Literary Pub Crawl, a well-spent two and a half hours. It starts upstairs at The Duke on Duke Street, and if there's too large a crowd for the 7:30 tour there's another one at 7:45. When it's over you'll wish you'd been drinking buddies with Oscar Wilde and Brendan Behan, although you will undoubtedly have spent much time under the table. There's also a tour of Trinity College, given by knowledgeable college students. It includes admission to the Book of Kells exhibit (€8), so is well worth the €10 price. Trinity was established in 1592 by Queen Elizabeth I in order to give Protestants a place to be educated in Ireland, else they'd go to the continent and be persuaded by popery. Today, it's one of the finest universities in Europe, its 47-acre campus charmingly compact. The Campanile bell tower is said to ring every time a virgin passes underneath. Oddly, I never heard it ring, despite the fact it seemed a popular spot for wedding photographs. Speaking of virtue...the statue of Molly Malone is another popular spot for photographs. She sells her... uh, wares at the end of Grafton St., where you can also find all the usual high street shops and some admirable street musicians. Try to engage them in conversation if you can, because in Ireland, it's the people who create the atmosphere. They're the friendliest and most loquacious anywhere. For instance, while we were waiting near the Bank of Ireland, a lorry loaded with stacks of sheetrock pulled out. The driver yelled out the window: "I've got the new bank notes here!" I daresay you'd never hear lorry drivers in England bother to entertain a group of bystanders with such well-aimed quips. We stayed at The Clarence, owned by U2. Its oak-encased elegance was understated, so understated the wood in our room was warped and peeling. I like to imagine the damage was caused by drunken rock stars spraying beer all over the place. It was also noisy: If you aren't planning to rock the night away, ask for a room facing away from Temple Bar, which is home to the majority of Dublin's bars, and a good portion of their drunks. 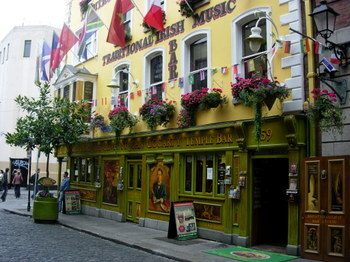 There is one cultural oasis in Temple Bar, located very near to The Clarence. Pop into the National Photographic Archive to see old photographs of Ireland (exhibits change periodically). Across Meeting House Square you'll find the Gallery of Photography and the Irish Film Institute. I did, however, take some photos: snapping a photo is so much easier than writing a novel, I've found. Perhaps someone should have just given Joyce a camera. In which the dog stars in her own photo album. A small visit to a small country. A summer holiday in Germany's southern district. A one-day trip to the EU capital. Because you can't do Cornwall in just one trip. The Dorset coast in Southern England. A ramble through pre-history, at Dunstable Downs in Bedfordshire. The small village of Fairford, in the southern Cotswolds, has one of the few examples of pre-reformation stained glass in its village church. Gardens at Grey's Court, including the wisteria pergola. Our trip to Scotland's Highlands. The Netherlands, aka Holland, is at its peak in April. Snowdonia, Llyn, and Anglesey, all in one convenient package. Some photos taken at Oxford, home of the dodo bird. Some photos of Oxford and its colleges, including places you can't normally visit. A winter trip to Paris, the "City of Light". Stratford, home of Shakespeare, captured in photos. A rainy visit to the RHS garden Wisley in Surrey.